Marcello Mastroianni plays Guido Anselmi, a director whose new project is collapsing around him, along with his life. 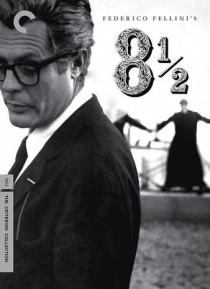 One of the greatest films about film ever made, Federico Fellini's 8½ (Otto e mezzo) turns one man's artistic crisis into a grand epic of the cinema. An early working title for 8½ was The Beautiful Confusion, and Fellini's masterpiece is exactly that: a shimmering dream, a circus… , and a magic act.